As I'm writing this we are underway from Bahia Concepcion (with Sue on the bow doing yoga) where we just spent several very enjoyable days. We departed from Isla San Marcos for Bahia Concepcion on Monday and while we were underway our depth sounder went out again, with the exact same symptoms as the unit which failed as we left Guaymas. I spent the trip to Concepcion trying to debug the issue, but finally gave up. This wasn't good as the charts for Concepcion are off by 1/2 to 1 mile and there are lots of underwater shoals to watch out for. Thankfully I had created a "photo chart" of the bay using Google Maps and a program called ChartAid, which allowed me to utilize the photo chart to plot a course into the bay. It was spot on and we had no problems getting in and anchored (other than sailboat race that we passed through on our way in). The forecast was for strong NNW winds, so we tucked into an anchorage known as Posada, which was the same place that we anchored last year in these conditions. The nice thing was that I could also tap into an Internet connection which would massively help trying to resolve the depth sounder issue. That is, if the satellite Internet connection would work. Well, it worked well enough to get some things figured out. I'd really like to thank Steve Rowlandson in the UK for all of his help with this. The first night we were there we went into the beach at Santispac to get off the boat and walk. After walking we stopped at a beach restaurant/bar where we met some local ex-pats. 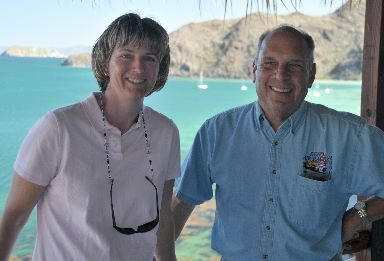 One of them, Jerry McCook was headed into the town of Mulege, which is about 12 miles from where we were anchored, and offered to take us along the next day. Having never been there and having nothing better to do, we tagged along and had a wonderful time with Jerry playing tour guide and showing us all all around. 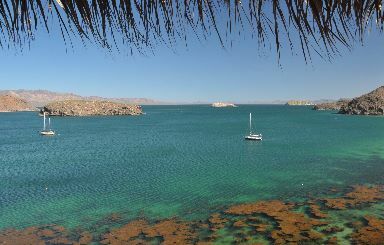 Jerry owns a beautiful house with amazing views of Bahia Concepcion. I can't imagine what it would cost to have a view like this in the US! The days there really felt like our first down-days since we arrived in Mexico as we've been working and working on completing boat projects, and finally we were able to relax. The weather is spectacular with lows in the low 60s at night and upper 70s during the day. While we were there we wandered around and re-explored the various bays. 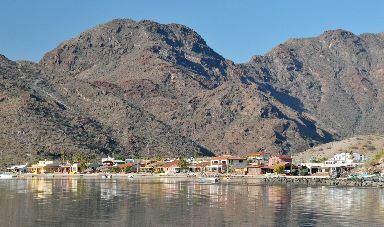 There are settlements in the various bays with varying degrees of infrastructure. These are built on the beach and from what I understand, they're not supposed to use any permanent building materials, so many people build temporary structures out of particle board, I guess with the concept that they don't loose much if a storm wipes it away. The settlement in Posada was one of the most well built settlements with streets, water and power from a generator which runs from 10 AM to 10 PM. It was really a nice place. Other bays go from having a few lean-tos to rows of particle board houses lining the beach. Many of the people who are down there are Canadians and due to regulations, can't spend more than 6 months outside of Canada if they want to collect their equivalent of Social Security and medical care. As a result, most of them had headed back to Canada and the homes were boarded up. On our last night there we met Jerry at Bertha's restaurant where many of the ex-pats hang out on Wednesday nights. What started off as a typical beach bar meal morphed into an amazing dining experience when a well trained flutist accompanied music on their sound system. It was lovely and we were in a beach bar in Mexico! Later they switched to dance music and the place filled with retired gringos strutting their stuff and hanging out. Believe me, the dichotomy was really something, with everyone from silicon enhanced women dressed in skin tight clothes to others in rag-tag shirts and shorts. It was quite the experience! Our "find" was Hostel Posada del Sol, which is a bakery and hostel in Posada. They have quite good bread, which doesn't come out until around 11-12. They also had good pizza on the day that we were there. Note that Anna's restaurant on Playa Santispac is closed on Wednesday nights and everyone heads goes to Bertha's restaurant in Playa Burro. Bertha's also has movie nights on Mondays.